COLLECT: there are 30 mysterious Series 2 Beaker Creatures including the limited-edition Color-Change Frostonians! RELOAD: each bubbling Reactor Pod is perfect for use with the Beaker Creatures Liquid Reactor Super Lab! Science meets collectibles in the second series of our popular Beaker Creatures line! Meet 30 new collectible creatures, including slimy Swampoids, mechanical Bytebots, and limited-edition Color-Change Frostonians! Extract them from their Reactor Pods, identify them with their classification cards, and explore their worlds through fun science facts. 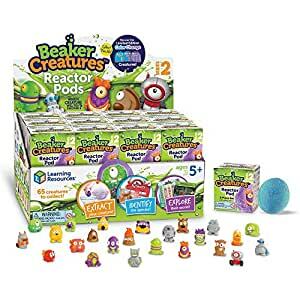 Creatures com in individual blink boxes, which include 1 figure in Reactor Pod, 1 classification card, and 1 mini poster with amazing science facts.